The Weather Makers – the 2005 best seller that propelled Tim Flannery to become the Australian of the Year (2007) and now the Panasonic Climate Change Commissioner for the Gillard Government. Dr. Allen puts every chapter of Tim’ Flannery’s thesis on global warming alarmism under the spotlight of the most up-to-date scientific realism - in climate sensitivity to carbon dioxide, the reliability of the temperature records, sea levels, glaciers, the true state of the Arctic, Antarctic, Greenland, the Great Barrier Reef, extreme weather events, acidification of the oceans, oscillating Atlantic and Pacific currents and much more. With CC Commissioner Flannery now leading the charge for a government carbon tax to mitigate runaway global warming, the timing for the publication reviewing the science of The Weather Makers Re-examined could not be better. There are few things more powerful than a quality book whose time has come. The Weather Makers Re-examined is such a book. It appears that not one of the scientists who have gone into bat for the government's program to stop Climate Change are willing to enter into discussion with Dr. Weston Allen. 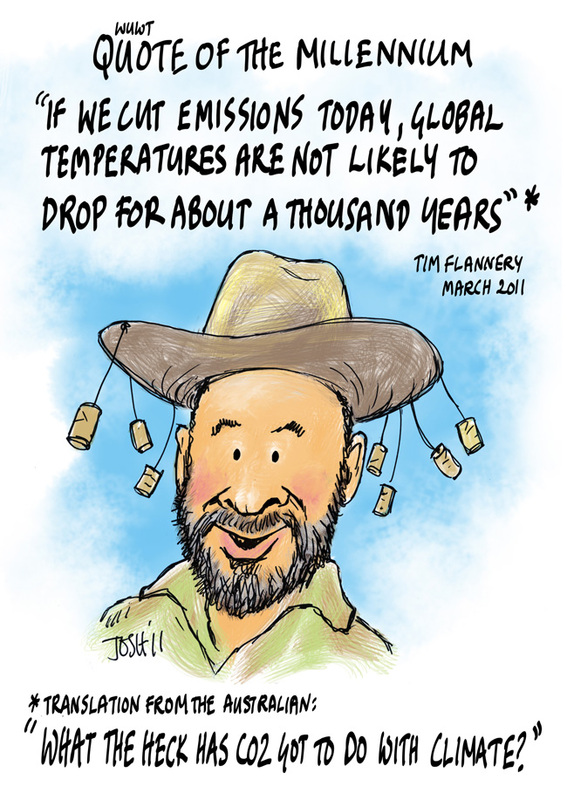 He has sent a copy of his book The Weather Makers Re-examined to Tim Flannery without a word of response. He has sent a copy of his book to one of the scientists, Professort Kurt Lambeck, who has put his name to a document put our by the Australian Academy of Science in defence of what is regarded as Climate Change orthodoxy. Dr. Allen has received no reply from this scientist either. In the view of these very authoritarian scientists, it appears they are insisting that their pronouncements are beyond argument or discussion. They support the steps being taken toward subjecting us all to a carbon dictatorship. 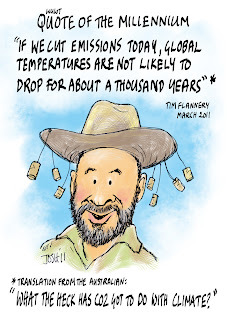 The points raised hereunder by Dr. Wes Allen are more or less a digest of some of the key points found in The Weather Makers Re-examined, a 400-page book that puts the theories and claims of Dr. Tim Flannery ( author of The Weather Makers) to the sword of the best peer-reviewed science. I would greatly value your opinion on my enclosed complimentary copy of The Weather Makers Reexamined, a comprehensive critique of Professor Tim Flannery’s well known book published in 2005. I would particularly appreciate you critique of chapter 15 (relating to sea level rise) in which I quote you fairly extensively and borrow one of your illustrations. The impact of sea level rise on pacific islands is covered in chapter 32. You will note that I do not call into question the fundamental science on global warming due to greenhouse gas emissions, but rather the many unwarranted catastrophic and alarming predictions found in The Weather Makers, countering them with sober scientific facts drawn mostly from peerreviewed literature. While I have attempted to be objective in my critique, there may well be some errors and biases in my work that need to be brought to my attention. Thus far the only criticism has been that I have missed some of Flannery’s errors. I note that you have read and commented on Ian Plimer’s contrary book, Heaven & Earth. 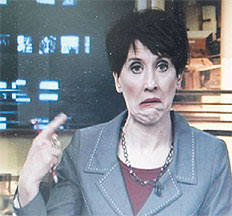 On ABC’s Lateline (27/04/2009), you said: “He has ignored a lot of information and he has twisted, I believe, a lot of information. There are a lot of references to various papers, some of mine included in that, but many of them are simply misquoted or misrepresented. . . . The science... It's sloppy. I think there's no other way, I would normally say go back and write it again.” You also told Robin Williams: 'Heaven and Earth is not a work of science, it is an opinion of an author who happens to be a scientist'. Further, in reviewing his book on Ockham's Razor, you wrote: If this had been written by an honours student, I would have failed it with the comment: You have obviously trawled through a lot of material but the critical analysis is missing. Supporting arguments and unsupported arguments in the literature are not distinguished or properly referenced, and you have left the impression that you have not developed an understanding of the processes involved. To give his arguments a semblance of respectability the book is replete with references. But the choice is very selective. Plimer will quote, for example, a paper that appears to support his argument, but then he does not mention that the conclusions therein have been completely refuted in subsequent papers. 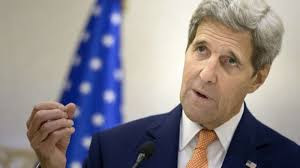 Elsewhere, he refers to a specific question raised in published work but does not mention that this issue has subsequently been resolved, has been incorporated in subsequent analyses, and is no longer relevant. Or he simply misquotes the work or takes it out of context. An example of this is a reference to my own in the Mediterranean where he gives quite a misleading twist to what we actually concluded. Other examples can be identified in this section, and throughout the book. Together they point to either carelessness, to a lack of understanding of the underlying science, or to an attempt to see the world through tinted spectacles. My review of The Weather Makers comes to similar conclusions, and I wonder why no one from the Australian Academy of Science has likewise critiqued it. Why has bad science slipped under the AAS radar? Is it perhaps because The Weather Makers is politically correct whereas Heaven and Earth is not? Summary: That ‘Earth’s climate has changed’ is incontrovertible, but whether ‘greenhouse gas emissions from human activities are the main cause’ (p. 2) is still uncertain. Why was natural variability (discussed in #4 below) largely ignored? 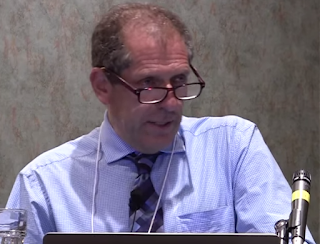 Since climate models significantly overestimated the very modest warming that has occurred so far this century, why does the SCC:Q&A give credence to model projections of 7:C? When correctly pointing out ‘the overall upward trend of average global temperature over the last century’, and when relating 21st century model projections to ‘pre-industrial temperatures’ (p.3), why was no mention made that Earth has been recovering from the Little Ice Age? Why give the impression that the ‘chance that it will be more severe’ is on par with the ‘chance that climate change will be less severe than the current estimates’? 1. What is climate change? When defining climate change as that persisting ‘for an extended period, typically decades or longer . . . usually 30 years or more’ and pointing out that El Niño oscillations last ‘only for up to a year or two’ (p. 4, Box 1), why not also point out that many ocean oscillations (PDO, IPO, AMO etc) also last for 20-30 years? Why not point out the strong correlation between these and changes in climate, frequency of El Niño/ La Niña events, hurricanes and cyclones? Although SCC:Q&A acknowledges that ‘some views are different’ from the positive feedback amplification theory presented on water vapour, why not mention equally important negative feedbacks from evaporation and cloud formation? Why show no negative feedbacks at all in Figure 1.1? Why no mention, for example, of increased photosynthesis reducing atmospheric CO2 and increasing evapotranspiration? What is ‘a significant fraction of CO2 emissions’ and where is the evidence that it ‘remains in the climate system for hundreds to thousands of years’? While the observed cooling of the stratosphere (p. 5) may be partly due to increased greenhouse gases, what about reduced solar UV radiation1 and ozone levels (mentioned on p. 11)? And can the fact that nights have warmed more than days also be at least partly due to the urban heat island effect (UHI)? 2. How has Earth’s climate changed in the distant past? While it is true that ‘several million years ago, global temperature was several degrees higher than today’ (p. 6), why not point out that that was also true of the Eemian about 120,000 years ago and of the Holocene Climatic Optimum just 7-8 thousand years ago? I agree that ‘Records are sparse in the Southern Hemisphere’ but not with the statement that ‘those available indicate little or no correlation with warming in the Northern Hemisphere during the Medieval Warm Period. Recent evidence shows a strong correlation. 3. How has climate changed in the recent past? Despite ‘extensive efforts to avoid or correct such problems’ (Box 3), has urban heat contamination been adequately removed from surface temperature records? In chapters 3 and 16 of my book I show that Professor Richard Lindzen is almost certainly correct in his explanation for the missing upper tropospheric ‘hot spot’ predicted by climate models. The problem lies not so much with the models or the observations of upper tropospheric temperature, but with the surface temperature records, particularly ‘over the past 50 years’ when warming ‘was nearly twice the rate of that for the past 100 years’. Even on the CRU/GISS/NCDC temperature record in figure 3.1, the 1970-2010 gradient is not much greater than the 1910-1945 increase. Had SCC:Q&A selected 1880 and 2008 as the end points, the temperature increase would have been less than 0.6:C – not ‘more than 0.7:C’. Figure 3.3,showing increasing record hot days and diminishing record cold days, reveals further such bias by going back only to 1960 (a cool interlude) – why not go back to 1900? And why not show the latest satellite temperature data, which still shows a little less warming than do the amalgamated surface records (Box 5)? While ‘the rate of loss of ice from Greenland has risen since the 1990s’ (p. 9), could it have been even greater before satellite observations began? What about Gerdel’s 1946-56 observations3? What about the papers published last year in Nature Geoscience 4 5 showing that the earlier estimates using GRACE were not properly corrected for glacial isostatic adjustment, that the sea floor under Greenland is falling more rapidly than was first thought and conclusion “that the Greenland and West Antarctica ice caps are melting at approximately half the speed originally predicted." And what about the Wada et al (2010)6 calculations of groundwater extraction, which has more than doubled since 1960 to 734Km3 annually, which found that it might be contributing as much as 0.8mm annually to sea level? How extensive is our understanding on all these aspects of climate science and how much uncertainty does SCC:Q&A really acknowledge? Why would an august academy of science say that CO2 is ‘making sea water more acidic’ (ibid) rather than slightly less alkaline? SCC:Q&A downplays the role of the sun to ‘only about 10% of the global warming since 1750’ (Box 7). Scafetta and West (2006)10 found a strong correlation between Northern Hemisphere temperature over the past 400 years and three reconstructions of total solar irradiance (TSI), and estimated “. . . that the sun contributed as much as 45 percent to 50 percent of the 1900-2000 global warming and 25 percent to 30 percent of the 1980-2000 global warming.” ‘The sun may have grown slightly cooler since 1960’, but the solar magnetic flux did not, and CERN recently confirmed Svensmark’s studies on cloud formation. 11 Krivova and Solanki (2003) 12 found a strong correlation between cosmic ray flux and global temperature prior to 1985, and the recent reduction in sunspot activity and solar flux may partly explain the reduced rate of global warming this century. While it may well be true, is there now sufficient data on submarine volcanic activity to categorically state that ‘the combined annual emissions from volcanoes on land and under the sea, averaged over several decades, are less than 1% of CO2 emissions in 2009’ (Box 8)? The document fails to point out that, since Australia’s contribution to global emissions is less than 1.5%, drastic unilateral reductions would make almost no difference to global temperature. Given that recent research has progressively lowered climate sensitivity towards 1:C or perhaps even less, to say that ‘This emission pathway . . . would be expected to produce a warming of around 4.5:C by 2100, but possibly as low as 3:C or as high as 7:C’ seems like unwarranted scaremongering. 6. What are the consequences of climate change? Why pick 1990, which was cooler than 1980, to reference a likely warming of half a degree by 2030 in Australia? When the global sea level has been increasing steadily at about 3mm/yr for several decades, why predict a rise of 15cm over the next two decades? Would not 6cm be more accurate? And why repeat the error that ‘oceans will become more acidic’ unless employing the scare tactics of propagandists? Predictions of extinctions, social unrest and dangerous tipping points and the depictions of floods, bushfires and coral bleaching are all designed to play on the emotions of the reader. 7. How do we deal with the uncertainty in the science? While acknowledging that ‘the exact amount of warming that will result from any particular trajectory for future greenhouse gas emissions cannot be projected precisely’, SCC:Q&A leaves the impression that the science is far more settled than it really is. The document fails, not so much in what it states as in what it omits. My advice to the Australian Academy of Science is the same as yours to Ian Plimer – rewrite! The Academy and science itself is in danger of falling into disrepute if climate science is not taken more seriously. 3 Gerdel, R. W. 1961: A climatological study of the Greenland icde sheet. Folia Geographia Danica, IX. warming. Geophysical Research Letters, 33: L17718 doi: 1029/2006GL02714. The link it irenicpublications is wrong. 78 exaggerations and over a hundred unsupported dogmatic statements. Why, anonymous, don't you buy a copy of The Weather Makers Re-examined, a very well written and researched book and see just how flimsy and false Flim Flannery's tome is. I was and still am confused. So I read Ian's "get expelled", the short version I guess. I found the book confronting, abusive too.While I did not like the tone, I finally understood the immensity of the argument for and against. I am now reading the 'Weather..' from Tom, who I am found of. I am finding his book disturbing in its alarmist scenarios.I would never have used the word 'alarmist' before. I believe in caring for the world, solar technology ....and de-population ( although not volunteering for the final solution). I expected a better , more convincing argument in 'Weather..'. Ian's got my ear. Hands down!! !